This masterplan was prepared for Igloo, the socially responsible property investment arm of Morley Fund Management. URBED have a long association with Igloo. We developed their Socially Responsible Investment (SRI) criteria and act as SRI assessors for their projects. Marshall’s Mill in Holbeck Leeds was the first site where they were acting on their own as developers and they asked URBED to be their masterplanners. Igloo’s initial investment was Marshall’s Mill, a historic textile warehouse that has been converted to creative workspace. 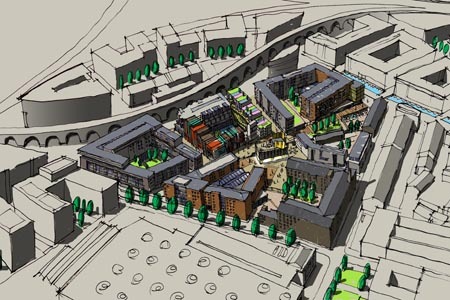 The masterplan related to the land to the north and rear of the warehouse including a number of historic structures. The masterplan includes 262 apartments, 12,000m2 of workspace, a 125 room hotel and 2,000 m2 of active ground floor uses. The masterplan was based on a detailed historical analysis of the area. Holbeck lies within a stones-throw of Leeds City Centre. However, because it is south of river it remained rural until quite late in the city’s development. When the area industrialised, it retained the original field boundaries creating a series of ‘superblocks’. The masterplan recreates one of these superblocks with a strong edge to the surrounding streets. However, it also creates a series of pedestrian routes through the site focusing on an inner court. At the centre of this court is a small historic building, the flax warehouse which is to be retained. The masterplan is based on U-shaped blocks with the open ends facing the inner court. They drop down in height towards the centre of the scheme and the space is enclosed with a series of gable ends. Igloo are committed to developing the masterplan in a way that creates a genuine piece of city, rather than the artificial environments that characterise many masterplanned areas. The masterplan is therefore to be developed by a series of architects.